"BLESSED ARE THESE HANDS shows photographs and tells stories of American women from infancy to 80, each holding something that represents her deepest values. These photos, with their commentary, create an inspirational photographic essay that speaks about the evocative images from each woman's viewpoint. The book highlights more than 100 women's sense of the sacred - and chronicles the breadth of women's spirituality today." 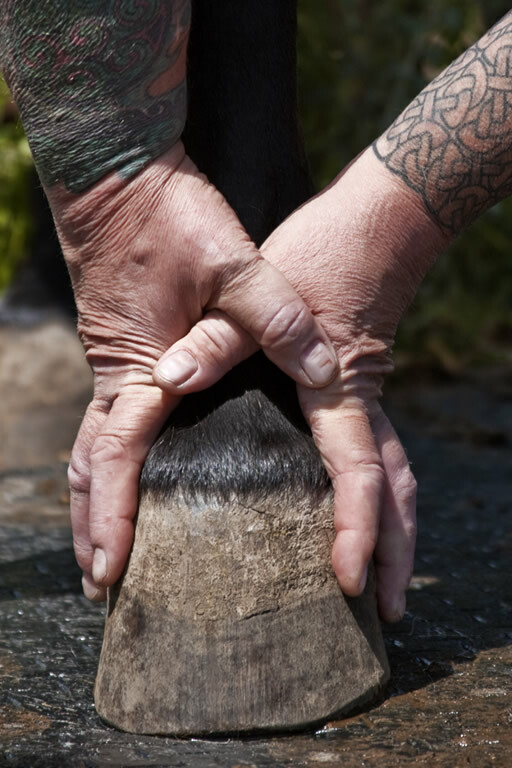 Hands and hooves and hearts aligned. My tattooed arms embrace the sturdy hoof of my gaited mule Tobe, representing my Sagittarian equestrian destiny, becoming the centaur, with Tobe the agent of my personal transformation. Learning to communicate with him, to correctly interpret his sensory awareness, is the most challenging work I am engaged in. When I prepare to ride I say a prayer of gratitude to the people and deities who have helped me to that mounting block. I focus on the positive, thanking my teachers and guides and religious metaphors, and then I put my left foot (tattooed with the Viking Helm of Awe) into the stirrup and I vault up into an ascended viewpoint. I leave the ground and meld into the collaboration with the mule that raises me into a heightened state of awareness. He and I both know he has better hearing and eyesight, he's far more experienced at being a mule than I am at being a rider. So on the trail we become one, a team, enjoying the journey and reacting to potential dangers. We collaborate to be the Centaur. And through the process I become stronger, burning through fear to achieve an alert focus, entirely in the moment.